Random lasers are powered by a beam of light from above. Random scatterers inside the laser (yellow dots) lead to chaotic emission of light into all directions. (Phys.org) —Random Lasers are tiny structures emitting light irregularly into different directions. Scientists at the Vienna University of Technology have now shown that these exotic light sources can be accurately controlled. The light they emit is as unique as a fingerprint: random lasers are tiny devices with a light emission pattern governed by random scattering of light. Understanding the underlying details of random lasing action has only been achieved recently. Now scientists at the Vienna University of Technology have presented a method to steer the radiation emitted by a random laser into a pre-determined direction. What has started out as a curious idea now has the potential to become a useful new type of light source. In a conventional laser, light is reflected back and forth between two mirrors. Meanwhile, the light is amplified by the atoms of the laser until a laser beam is formed which exits on one of the two sides. "A random laser works without any mirrors", explains professor Stefan Rotter from the Institute of Theoretical Physics at the Vienna University of Technology. "It consists of a granular material in which light is randomly scattered and forced onto complicated paths." Along these paths the light is amplified. At which position it eventually exits the laser depends on the random inner structure of the laser material. Here, the beam of light is first sent through a mask, so that different regions of the laser are pumped with different amounts of energy. This selectiv pumping leads to the laser emitting a beam of light exactly into the right direction. The laser has to be supplied with energy so that it can amplify light. Usually, the required energy comes from an external light source – a technique called "optical pumping". Ordinary incoherent light is pumped into the laser from above, then it is converted into ordered, coherent laser light, which is radially emitted into all directions. "The essential point is the way in which the random laser is pumped", says Stefan Rotter. "Our idea is to pump the laser not uniformly, but rather with a specific pattern, which is optimized such as to generate exactly the laser beam we want", says Rotter. The pumping pattern selectively stimulates certain regions of the random laser, which then cooperatively produce light emission in a very well defined direction. 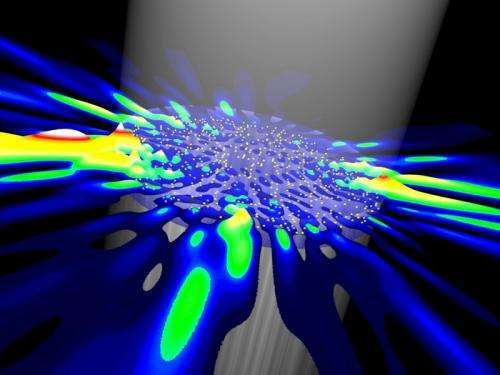 To determine the right pumping pattern that leads to the desired laser beam, the scientists at the Vienna University of Technology employed extensive computer simulations. "We start with a randomly generated initial pumping pattern and calculate the resulting laser emission. The pumping pattern is then adjusted step by step until the laser sends out light in exactly the desired direction", says Rotter. 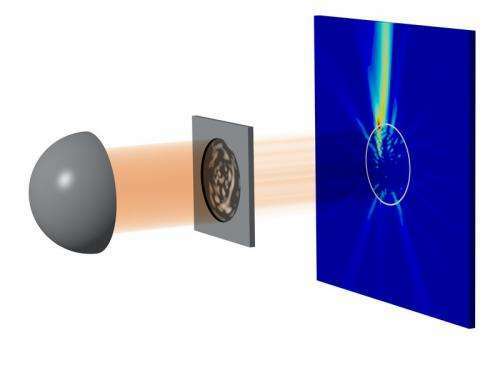 As all random lasers are different, this optimization process has to be carried out for each device individually – but once the solution is known, the same laser beam can be created again and again. In principle, one could also steer the laser beam from a given direction to any other direction by changing the pumping pattern appropriately. Stefan Rotter's team is cooperating with a research group in Paris, where random lasers are fabricated and studied in the lab. Together, the researches now want to test their findings in the experiment. If the experimental results indeed show that random lasers can be forced to relinquish their randomness, this would constitute a major step towards technological applications of these exotic new light sources. What has started out as a curious idea now has the potential to become a useful new type of light source. Which is what, exactly? One reason I read these articles is to read answers to questions like this. But there weren't any answers here. The most obvious application for this is Holography, but it could also have applications in lithography. Single atom transistors - Yes! I think this site offers a better explanation of light, atomic spectra, than the Rydberg equation and give clearer view of what light is. The helium I solution is not complete but I can find it no where else either. for some reason this site seems to hate new ideas , but it is under heliumspectra at wiki. Any help on finding the rest of helium I spectra would be helpful to. Thank you.